Frugality, in the dictionary, is simply economy. For the individual this means exercising prudent techniques for saving so that resources are not wasted but used judiciously to serve the most appropriate hierarchy of needs without needing to beg or borrow. For our state, the definition would apply; except, the sources of revenue would no longer be classified as voluntary contributions (begging or borrowing) but would become forced contributions through taxation and debt-bonding. Likewise, the state that is extravagant or wasteful will quickly impoverish itself and its citizens. Additionally, in their poverty, the citizens will be forced into dependence and the state will experience corruption throughout its domain. Let’s look at some numbers. During the 2015-17 biennium, Oregon’s Department of Administrative Services (DAS) processed nearly $8 billion worth of procurement services. That’s big money! That is 8,000 million dollars’ worth of goods and services. Wow! Especially when you consider that Oregon only has 4.1 million residents. That’s right! Oregon spent 8,000 million dollars on 4.1 million people. That’s just under $2,000 of stuff for every man, women and child of every category, background, country of origin, make or model. That’s just stuff; the total outlay for all goods, services, salaries, wages and benefits came to about $9,100 in 2016, on a per capita basis. 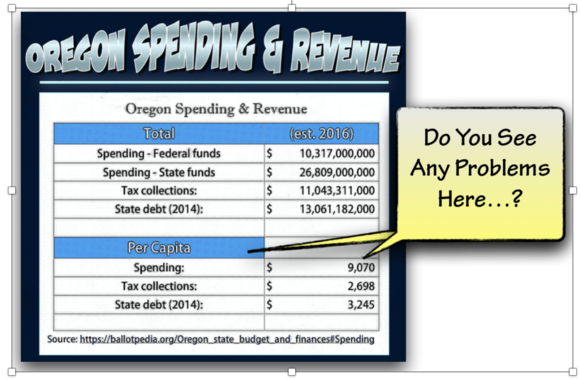 On the other-side of the accounting ledger Oregon only collected $2,700 in taxes on a per capita basis. This is what any normal person would call living beyond one’s means. The federal printing press barely helps reduce our overall shortfall, even though that contribution is an amazing 30% of all state revenue. Recently, the Secretary of State’s (SOS) office auditors found Oregon missed opportunities to save 5 percent to 20 percent of the state’s procurement budget. That means Oregon missed the opportunity to save 1,600 million dollars ($1.6B) on state purchases. The audit reveals that Oregon’s current procurement systems lack the information necessary for procurement specialists to effectively evaluate spending with regard to possible opportunities for cost savings. Understandably, the DAS specialists buy lots of stuff for many disparate agencies. They purchase for Capital Finance and Facilities, Fleet Services, Operations and Maintenance, Building Security, Custodial, Landscape, Repair and Maintenance, Planning and Construction Management, IT, Real Estate Services, Interiors, Leasing, Land transactions, Surplus Property, and Enterprise Goods & Services. This extraordinary range of goods and services crosses multiple agency boundaries and the state’s procurement services could be effectively streamlined if there existed a single data-store for this information. The audit found that of the $8 billion spent in procurements in 2015-17, the state only has purchase-level data for about 12.5% of the transactions, or roughly $1 billion. What about the source level information on the other 87.5% of the state level procurements reviewed by the auditors? Obviously, the auditors found this to be subpar. SOS Dennis Richardson’s office suggested that the statewide implementation of an eProcurement system should be implemented and would provide the additional data needed to perform a full spending analysis. It is no surprise that understanding the capital cost of an asset, including its full-life cycle costs – maintenance, operating and disposal costs, along with supplier bidding and contract opportunities could result in hundreds of millions in potential savings. Obviously, taking people’s hard-earned money away from their families and communities, only to push loads of cash into a broken vending machine of a government, is not only senseless, it is immoral. 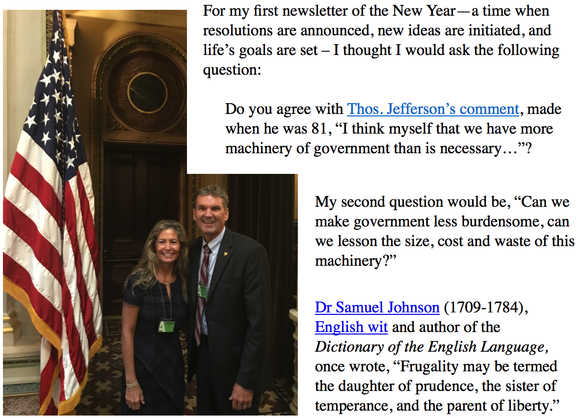 As a legislator, I have a duty to my constituents, and I will continue to be a strong voice for government accountability and change this upcoming session. In an era of rising taxpayer dissatisfaction, higher expectations and rapidly changing economic conditions, high-performance sourcing, procurement, and supply chain management services are crucial to our state. Our state’s ungainly combination of legacy systems, spreadsheets, email, and yellow sticky-notes has burdened taxpayers with unnecessary costs. Many of these problems can be relieved with advanced digital technologies for sourcing and procurement. The lack of technological integration and automation in our state is a legacy built over the past 30 years. It is time for leadership so that we can make Oregon great again. It’s time for Governor Kate Brown to trim expenses, reduce unnecessary burdens and pursue budgetary and tax moderations. These steps would empower Oregon’s citizens to live within their means while enjoying the abundance that comes from the sweat of their own brow, the strength of their hands and the creativity and innovation of their minds. Remember, if we don't stand for rural Oregon values and common-sense, no one will!